22 bronze figures at Littlehaven beach, South Shields. Installed in 1999 as part of the Art on the Riverside project. Picture: s_gibson72 (2008, CC BY-NC-ND 2.0). The interviews in The Talk of the Toon archive come from the Diachronic Electronic Corpus of Tyneside English (DECTE). The interviews last around 60 minutes. Names and other personal information are removed from the recordings before the interviews are incorporated into the archive, in order to preserve the privacy of the participants. If you live in the North East (Northumberland, Tyneside, Wearside, County Durham or Teesside) and would like to take part in one of the interviews, or would like more information about what's involved, fill in the form below and click 'Send'. 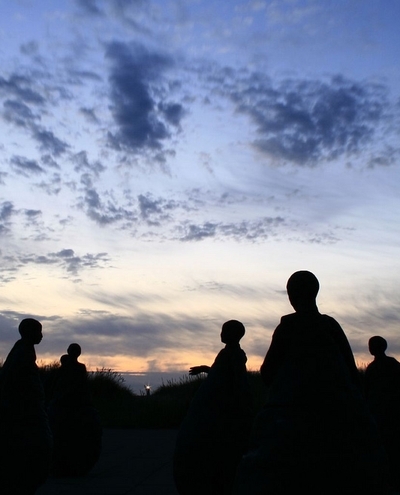 What year was the Conversation Piece sculpture installed on Littlehaven beach? * The authentication question is used to prevent automated spam programs from hijacking this form.